Five years ago, TreeHugger and other green design sites were mad about shipping pallets; next to shipping containers they were the most popular recycled building materials on TreeHugger. As an architect I have to admit that I was never fond of them; it all seemed a bit grungy and rough. They also were often toxic, being treated either with chemicals or with heat to control bugs. Some American ones were treated with the neurotoxin and carcinogen methyl bromide (marked MB). This made them unpalletable. Also five years ago, every site was full of infographics, which I also hated; they took ten times the space to convey what a few words might, they often linked to really sketchy online universities and worst of all, they were impossible to check because they didn't have hyperlinks. So I was surprised when I was pitched an infographic on building with pallets from FIX, a website that I didn't know of, that uses infographics to convey useful information and doesn't link you to some online mortgage broker. 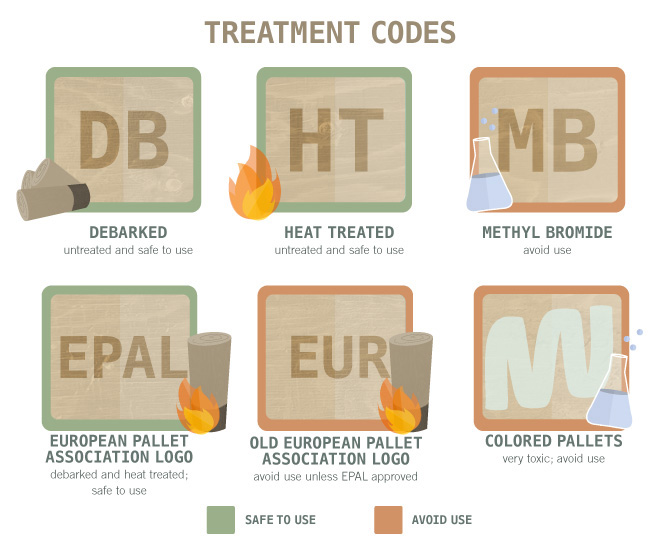 They actually cover the issue of pallet safety, linking to another infographic that I will put here first, and they have lots of written content to go along with the infographic. 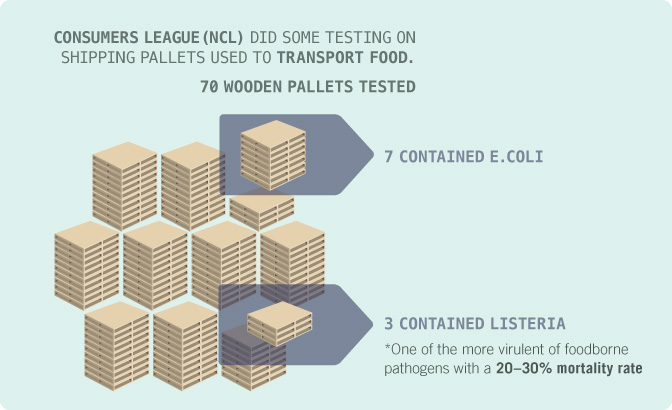 They also mention that pallets that carried food might well be contaminated with listeria, which we covered here. They do not mention that pallets are not really meant to be used once and thrown away, but that they are perfectly reusable. If you are going to take a pallet you should ask if you can have it; some might consider it theft. Unlike many other infographics we have shown, these come with a lot of written content on the post at FIX, have a look there if you are considering this. So get your tools out (they have a good list of what's required but neglect to mention tweezers and alcohol for sliver removal. They also suggest using a chisel as a pry tool, which is a bad idea; get a pry bar. Chisels are sharp and will be damaged if it hits a nail.) and go nuts. And if you want to get really ambitious, here is a roundup of pallet architecture. Remember pallets? Remember infographics? We have both in one post!